In order to play fluently especially when sight reading a musician needs to be able to recognize notes instantly. I have in the past taken over students when they have changed teacher and noticed that when they are learning a new piece, or when they are sight reading, they will use acronyms such as "FACE" or "All Cows East Grass" when working out the notes. Maybe this describes you or if you are a teacher, describes some of your students. This technique would be fine if you were doing Music Theory, but for playing, it is a very limited approach. With this in mind I have prepared a "Note Recognition Flashcards" video where a note will appear on the screen for just a few seconds. You will need to play the note instantly before the next one appears. 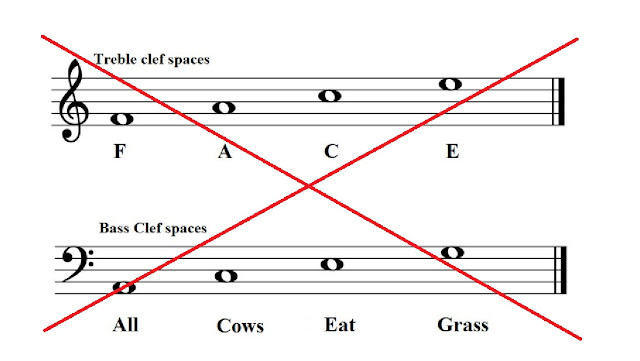 You can even use this video away from your instrument by simply naming the notes that you see. If you struggle with, or have a student that struggles with recognizing notes quickly, repeat this exercise a few times and you will soon be able to improve your note recognition. Please let me know in the comments below if it has helped you to improve your note recognition.